It is essential for medical practices to make smart decisions about how to spend money, so it makes sense that providers want to understand the financial implications of an investment in telemedicine technology. It is clear that telemedicine has numerous benefits for patients including better access to care, increased convenience, fewer hospital readmissions, less cost for parking or public transportation, fewer days missed from work, and many more. However, what does telemedicine mean for the practice regarding profitability? Will the cost for the technology and setup be quickly recouped? For practices that select the right technology, there’s good news. The ability to offer video visits has the potential to boost revenue, and directly impact the bottom line. Today, most telephone calls go uncompensated. Things like refill requests, medication questions, urgent after-hours calls, and the like can represent a significant amount of the provider’s time that is used, but not billable. With a telemedicine solution in place, some of these phone calls can be conducted as remote visits, which do earn compensation. Providers can increase revenue without doing any additional work. Telehealth helps providers grow their practice in a couple of ways. First, patients are eager to find providers who offer the convenience of video visits. For example, 79 percent of consumers currently caring for an ill or aging relative say a multi-way video telehealth service would be helpful, according to a study by American Well. When you offer and market the availability of telemedicine, your practice will attract patients for whom this service is important. 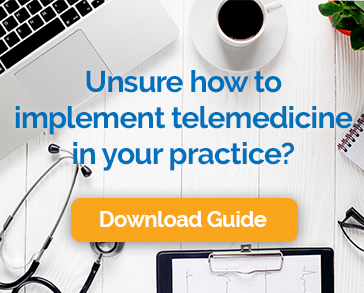 Telemedicine also helps grow your practice by virtually removing geographic barriers to care, giving you a broader market from which to attract patients. This is particularly important for specialty care providers, who can serve patients who might not otherwise have access. Demand for video visits is growing and providers that don’t offer the service risk losing patients to those who do. American Well reports that one in five patients would be willing to switch primary care providers to one who offers remote visits. According to a study by Merritt Hawkins’, for large markets, the average wait time to see a family medicine physician is 29 days (up 50% from 2014) and ranges from a high of 109 days in Boston to a low of 8 days in Minneapolis. It’s no wonder that patients are turning to alternative providers such as retail clinics, urgent care centers, and online-only providers. Telemedicine gives providers the opportunity to offer same-day appointments by allowing for scheduling flexibility. If a patient requests an immediate appointment, merely reach out when there is an opening in the schedule. Providers can also offer weekend or evening appointments without any impact on office hours or staffing. The most valuable resource in any medical practice is the provider’s time. No-shows eat into profitability by creating gaps in billable time. While no solution will eliminate no-shows and last-minute cancellations, telemedicine can make a big difference. Research from MGMA found that of patients who reported missing an appointment, almost 24% of them say that the reason was a barrier like work or transportation. These issues can be avoided with video visits. Video visits can fill scheduling gaps, maximizing billable time. They also result in fewer people in the office making flow easier for patients who do come in and reducing some of the pressure on your office staff. This results in higher customer satisfaction for patients both online and off and reduces the opportunity for data entry and other administrative errors. Because you can conduct a telemedicine visit from anywhere, some providers have used it as an opportunity to increase revenue by offering evening or weekend hours or even adding to their list of services. Weight loss coaching, smoking cessation, and other lifestyle-related services make a great addition to a practice when they can be done without impact to more traditional services. Planning and a bit of creatively are needed, but there is a clear economic incentive for introducing telemedicine services. Add that to happier, healthier patients, and you have a recipe for success.